Died: 9th February 1915; age 22; KiA – south of Ypres. Killed alongside William Ernest Miller. Relatives Notified & Address: Son of the late Giles & Maria Alcock. Brother to JOHN HENRY ALCOCK (KIA). 1901 6, Lady Lane, Ipswich. George was 9 years old and living with his father & siblings. Giles Hale Alcock, 59, a Shoe Maker – own account, born Norwich, Norfolk. Ellen Harriet Alcock, 26, a Nurse Maid, born Ipswich. Henry Thomas Alcock, 20, a Coal Porter, born Ipswich. William Thomas Alcock, 18, a General Labourer, born Ipswich. Thomas James Alcock, 16, an Errand Boy, born Ipswich. Elizabeth Rebecca Alcock, 13, born Ipswich. 1901 George’s mother was a visitor to 70 year old Mary Mellonie & her 5 nieces & nephews at her home – 3, Bramford Lane, Ipswich. Maria Alcock (nee Bygrave), 49, a domestic Nurse, born Norwich. 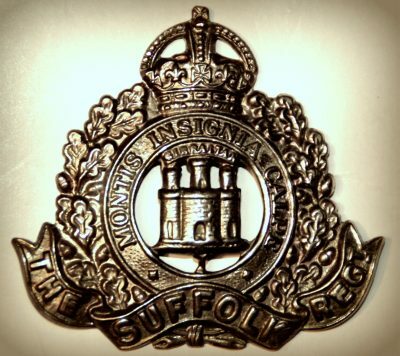 George was 18 years old, a Soldier, ranked Private with the 2nd Battalion, Suffolk Regiment. George’s father Giles Hale Alcock, died 1914, Ipswich. Soldiers’ Effects to Maria – mother, Giles John Alcock – half brother, Henry & William – brothers, Maria Salway, Ellen Atkins, Henrietta Hutchings & Elizabeth Brooks – sisters, Alice Kate Alcock – sister-in-law. George is also remembered at The Mission Free Church Curriers Lane, Ipswich. Throughout February 9th 1915 the enemy shelled unremittingly one part or another of the Verbrandenmolen sector. The trenches held by the 1st Battalion were in a shocking state, those on the right being two feet deep in water. Battalion headquarters, despite the attention it received from the enemy’s artillery during the afternoon, remained intact.